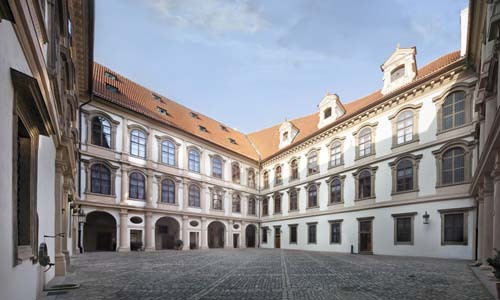 The Senate of the Parliament of the Czech Republic has its seat in Prague, Malá Strana (Lesser Town), in three ancient palaces: Waldstein, Kolowrat and Small Fürstenberg. Duke Albrecht Waldstein, one of the most important noblemen of his era, had the Waldstein Palace and its gardens built as his representative residence in the 17th century. The palace was owned by Albrecht Waldstein’s descendants almost continuously until 1945. The name Kolowrat Palace refers to Count Zdeněk Kolowrat Krakovský, who bought the palace in the 19th century. 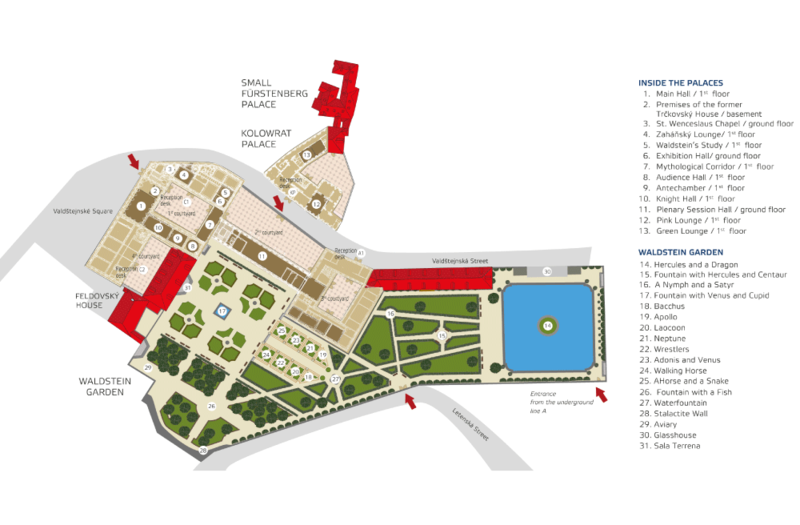 The palace was rented by the Czechoslovak state in 1918 and two years later was bought as a seat for the Council of Ministers. Troubled meetings connected with the Munich Agreement and the Protectorate of Bohemia and Moravia were held there. The Small Fürstenberg Palace was owned by Maxmilian Egon III, Prince of Fürstenberg since 1866. The palace was later named after him. The palaces became the property of the Czechoslovak State in 1945 and since then have been used by various state institutions. The Senate of the Parliament of the Czech Republic took its seat in those palaces in 1996. The Waldstein Palace together with its garden, and the Kolowrat and Small Fürstenberg Palaces all form part of the national cultural monument that is the Seat of the Parliament of the Czech Republic. The reconstruction of the whole complex, initiated by the Senate was awarded the prestigious Europa Nostra Prize for the conservation of cultural heritage in 2002. The Senate Chancellery pays close attention to the maintenance and reconstruction of the historical palaces continuously and systematically.